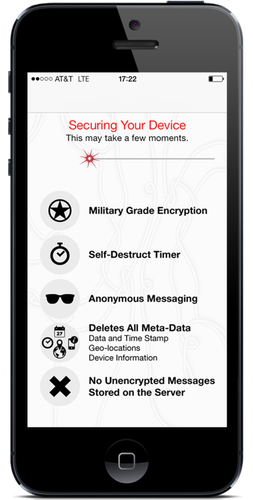 Wickr's app offers a range of security features. The two-year-old San Francisco company said Wednesday that it's selling a range of security tools to other app makers and social media companies, as concerns over government surveillance, cyberattacks and data tracking run high. Wickr's own service is designed to encrypt people's messages on their mobile devices, and keep the messages scrambled as they pass through the company's servers. Wickr says it does not hold the keys to decrypt people's messages, so even if law enforcement or the government come knocking, Wickr claims it can't hand anything over. Wickr said it will sell its security products individually and as a suite. Chief among them is Key Manager, which provides "perfect forward secrecy," an advanced form of encryption that generates a unique set of keys for each message that is created on someone's cellular phone, the company said. Because the keys are generated on users' devices and because Wickr does not have access to the keys, the tool provides end-to-end encryption, said Wickr CEO Nico Sell. "We're a transporter of gibberish," she said in describing the company. Sell declined to specify how much Wickr charges for its products, but said that it will be more than US$1 million for licensing one of the tools. Non-disclosure agreements prevent Wickr from citing some of its licensees, Sell said, but the company is targeting providers of mobile apps and services with at least 50 million monthly active users. Those targets include WeChat and Line, Sell said, two of the largest mobile messaging apps in Asia. Another major offering is Wickr's Friend Finder tool, which employs cryptographic hashing to link users with their social connections without uploading contact lists. Snapchat recently learned the hard way that its friend finder had some security vulnerabilities, after researchers matched people's phone numbers to their Snapchat accounts. Sell also cited Wickr's Timer product, which will let any app's data self destruct, as an important tool for other apps. Messages sent through Wickr can be tagged with an expiry date so they'll be erased from the person's phone after a certain period of time. "Every piece of data should have an expiration date on it," she said. Wickr is hoping to make the larger landscape of apps safer. "Our security solutions address the most recent social media customer breaches," said Robert Statica, Wickr's co-founder and chief technology officer, in the company's announcement. Wickr's tools could be used by any messaging, voice communications, gaming and dating app. The company says it has roughly 1 million registered users.